"Actually, the nature of this world is darkness. Therefore the basic injunction is, 'Don't remain in this darkness. Go to that effulgent region.' The Bhagavad-gita says the same thing. Everything is there in the Bhagavad-gita. So our request is that you read the Bhagavad-gita As It Is. That is my request. I am not charging anything; I am not making a profession. This Sankirtan Movement is free. Not that it is a secret thing and if you pay me something then I shall give you some mantra. It is an open secret. 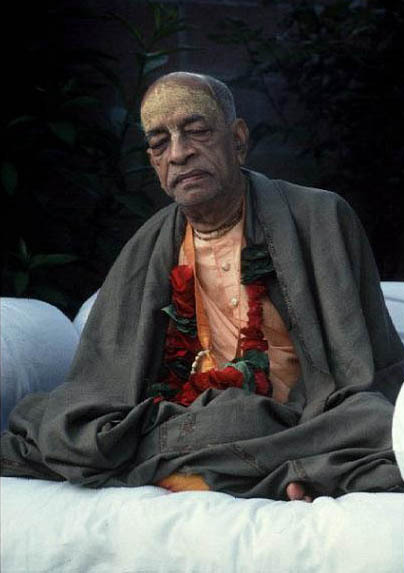 If you chant Hare Krsna, there is no loss, but there is great gain. You can try it. We are freely distributing it by chanting. Join with us and try to understand this philosophy. We have a monthly magazine, Back to Godhead, and many publications, Bhagavad-gita As It Is, Teachings of Lord Caitanya. If you want to understand this movement through philosophy, science, argument, we are prepared. But if you simply chant, there is no need of education nor philosophizing. Chant Hare Krsna, Hare Krsna, Krsna Krsna, Hare Hare/ Hare Rama, Hare Rama, Rama Rama, Hare Hare, and you will gain everything. Thank you."